[[Photo caption]] FINAL RITES CONDUCTED WEDNESDAY MORNING FOR LUIS MARTINEZ, 20 Denver Post Photo by Dave Buresh [[end photo caption]] LUIS MARTINEZ, ASESINADO Denver.. Marzo 17, 1973 LUIS MARTINEZ, fue asesinado por la policia de Denver. Segun los hechos la policia ataco la Raza en el distrito Chicano. Aparte de asesinar a Luis, la policia tambien arresto 62(?) jovenes Chicanos. Luis Martinez, joven the 20 anos era uno de los mas activos miembros de la Crusada por La Justicia, ademas era miembro de la Raza Unida Party. Su vida la dedico al Movimiento. Luis se dedicaba como director del Ballet Flklorico De Aztlan, de la Escuela Tlatelolco. Aldofo Corky Gonzales y toda la comunidad Chicana an demandado que se investigue el asesinato de Luis Martinez por manos de la policia de Denver. El Departamente de Justicia Federal esta haciendo las preliminares investigaciones. QUE SE HAGA JUSTICIA. 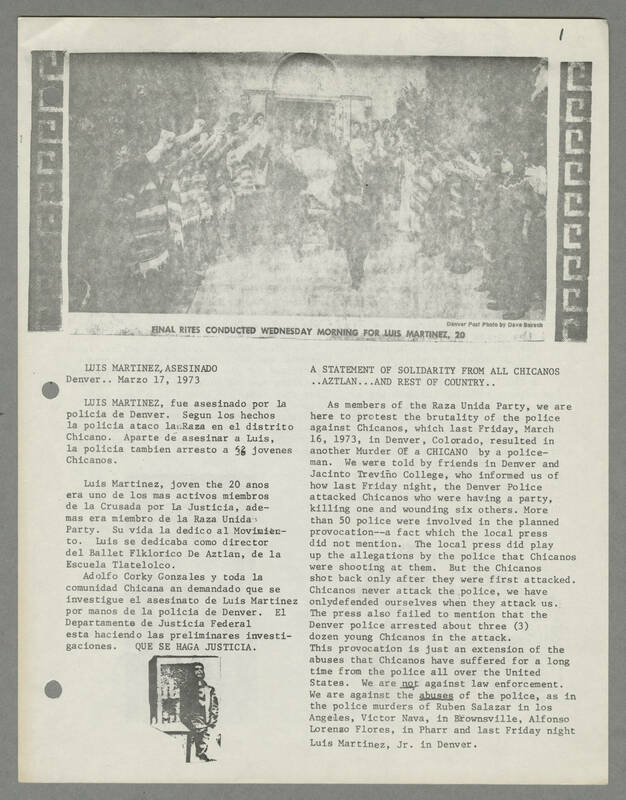 A STATEMENT OF SOLIDARITY FROM ALL CHICANOS ..AZTLAN...AND REST OF COUNTRY.. As members of the Raza Unida Party, we are here to protest the brutality of the police against Chicanos, which last Friday, March 16, 1973, in Denver, Colorado, resulted in another Murder Of a CHICANO by a policeman. We were told by friends in Denver and Jacinto Trevino College, who informed us of how last Friday night, the Denver Police attacked Chicanos who were having a party, killing one and wounding six others. More than 50 police were involved in the planned provocation--a fact which the local press did not mention. The local press did play up the allegations by the police that Chicanos were shooting at them. But the Chicanos shot back only after they were first attacked. Chicanos never attack the police, we have onlydefended ourselves when they attack us. The press also failed to mention that the Denver police arrested about three (3) dozen young Chicanos in the attack. This provocation is just an extension of the abuses that Chicanos have suffered for a long time from the police all over the United States. We are [[underline]]not[[end underline]] against law enforcement. We are against the [[underline]]abuses[[end underline]] of the police, as in the police murders of Ruben Salazar in los Angeles, Victor Nava, in Brownsville, Alfonso Lorengo Flores, in Pharr and last Friday night Luis Martinez, Jr. in Denver.